A friend gave me three exquisite skeins of Alchemy 100% bamboo yarn in the 62c Resolution colourway, and I’ve visited and petted this yarn many times in the three years since I’ve had it, waiting for the right project to present itself. This project had to meet three criteria: first, the pattern must showcase the elegant beauty of the gorgeous hand-dyeing (with very short colour repeats); second, not be too small; and third, us as much as possible of the stunning yarn. Clearly, something lacy and elegant, without being too busy, was in order. 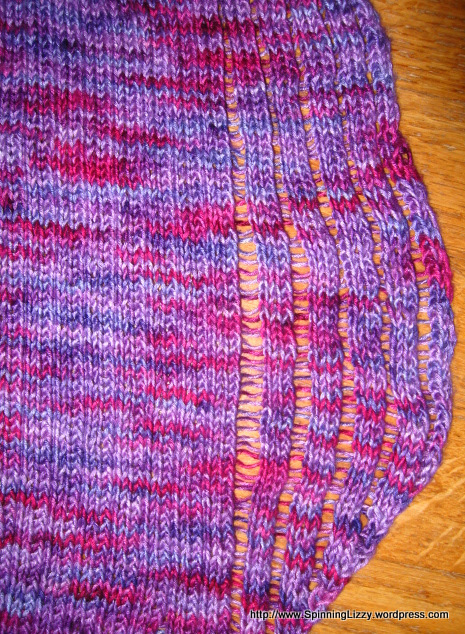 Enter Clapo-ktus, a hybrid of Clapotis and Baktus, The lacy effect comes from purposely dropping stitches between ladders of stocking stitch. 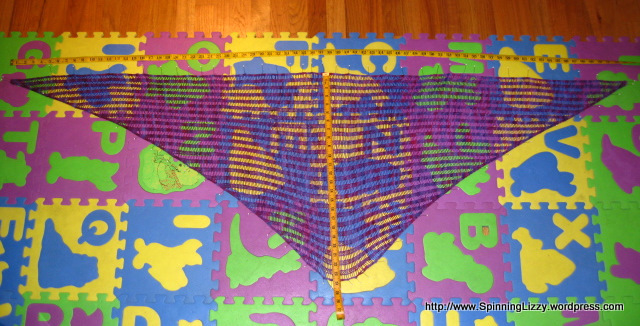 The scarf is triangular, so the trick to using up all the yarn is to weigh the yarn before you start knitting, then several times along the way towards the midpoint of the triangle, until half the yarn is used up. At that point, you stop increasing and begin the decreases back down to the other small corner of the triangle. 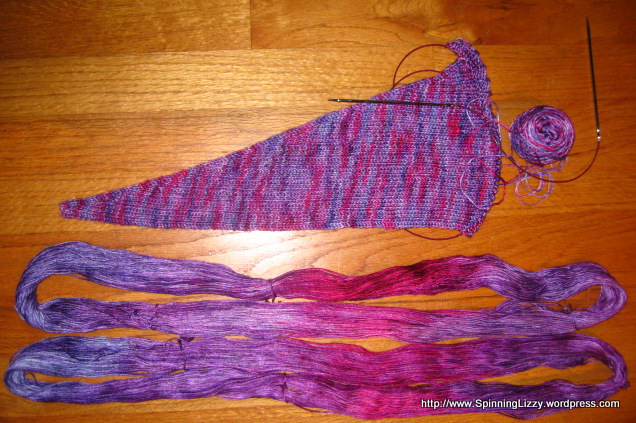 In theory, it seems easy enough, but I suspect my gauge changed during the knitting, muddling things considerably. I nearly had heart failure, knitting to the finish, awash in anxiety that I would run out of yarn. (It has been discontinued, and more was not to be had! And even when it had been available, it had cost a fortune! 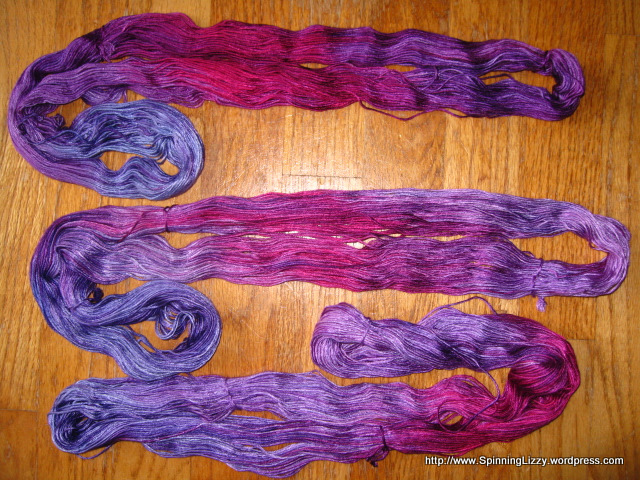 Even if I had a fortune to ransom another nonexistent skein, the dye lots would not match, and I would have too much left over!) When I was nearing my mid-point, I made the decision to allow an extra four grams of yarn over the requirement for the second half of the knitting. 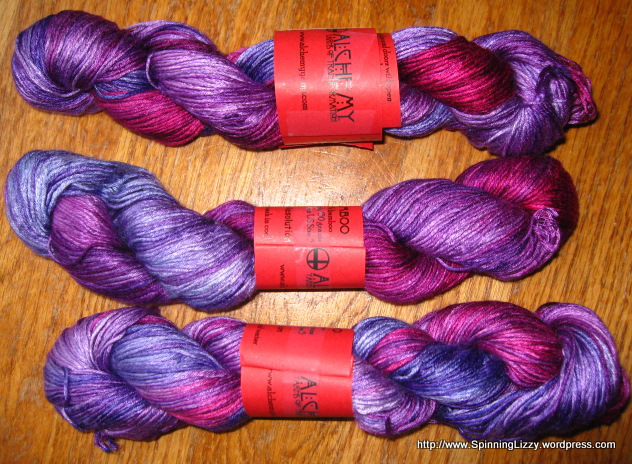 It had been an agonising decision to make, because I certainly did not want even one extra gram of this precious yarn to go to waste, let alone four. 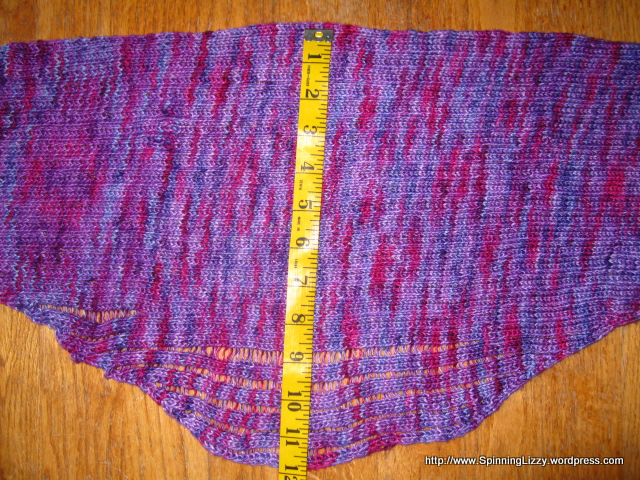 I’m glad I did that, for even with the generous allowance, all that remained at the end was a scant 11″ wisp of yarn. Who knew that 150 grams/450 yards of yarn could provide more heart-stopping action that left me gasping for breath at the end more than reading or watching any thriller might have! This project taught me how to twist my stitches, from both the knit and purl stitches, and how to identify such stitches by sight. 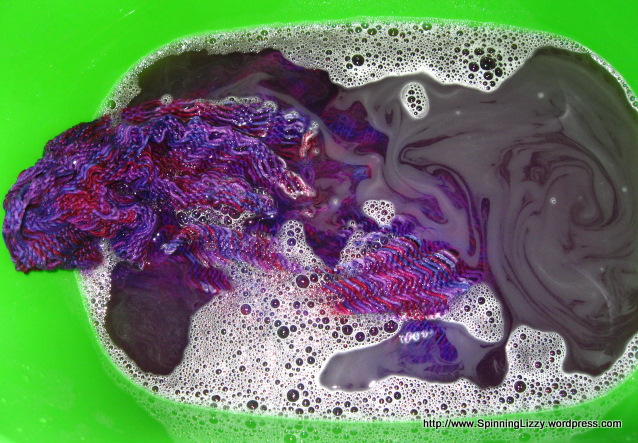 The bamboo yarn bled so much when I washed it (with a spoonful of Synthrapol in the wash), I worried the deep berry colours would wash out. Blocking the scarf was necessary to complete the lacy look. While knitting, I purposefully made the selvedge stitches looser, but even so, this bamboo yarn does not stretch like wool, so the edges limited how aggressively I could block open the scarf. You’ll notice the colourful foam tiles on my floor. They were installed when my son was a baby, and even though he has long outgrown the need for them, I’ve kept them for him to jump around on when playing video games, and (more importantly) because they are the perfect area for blocking my knits! 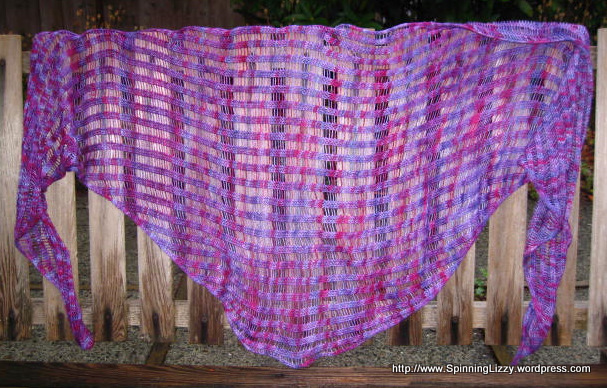 This bamboo yarn knit up like silk; slinky, shiny, but not stretchy. 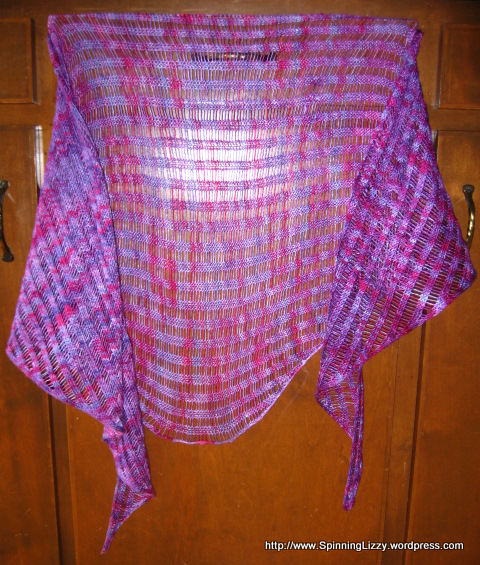 The resulting fabric drapes beautifully, and the shawl is perfect for summer.